﻿Ascension: Calendar, History, Tweets, Facts, Quotes & Activities. Ascension commemorates the day that Jesus ascended into Heaven (Acts 1:1-11) after spending 40 days appearing to his disciples after his resurrection. The disciples thought Jesus was going to restore the earth to the Kingdom of Heaven, but instead, as he promised to send the Holy Spirit to give them power, he ascended into Heaven and disappeared in a cloud. 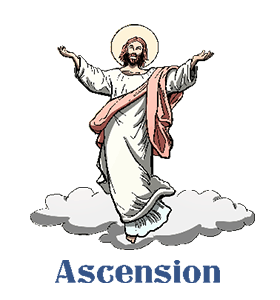 Ascension is the 40th day after Easter, celebrated on the sixth Sunday of the Easter season in Protestant churches and on the 40th day after Easter in Roman Catholic churches. An ancient custom in England, called the Beating of the Bounds, is often performed on or near Ascension. Before maps, this was the day that people would mark the boundaries of their property with stones marked with chalk. Some English churches still perform the custom, led by the vicar. Church members carry sticks to wick at weeds as they process. In the Orthodox tradition, celebration of the Jesus' Ascension starts with an all-night vigil or vespers (evening) service beginning on Saturday. Ascension is the 40th day after Easter, celebrated on the sixth Sunday of the Easter season in Protestant churches and on the 40th day after Easter in Roman Catholic churches. It commemorates the day that Jesus ascended into heaven (Acts 1:1-11) after spending 40 days appearing to his disciples after his resurrection. Johann Sebastian Bach wrote several pieces related to both Easter and the Ascension. Listen to Bach's the Ascension Oratorio, Lobet Gott in seinen Reichen (Praise God in His Kingdoms) on YouTube. Go bird watching. A custom in Sweden, is to get up early in the morning of Ascension and venture out into the woods to listen for the call of a cuckoo. It is considered good luck to hear one on this holiday. Go to church and learn about why Jesus' ascension is important to the Christian faith. Jesus is considered to be both human and divine, and the ascension is an illustration of Christ's divine nature. View paintings that depict the ascension. One of the most famous works is The Ascension Of Christ by Rembrandt Van Rijn.